The A.V. Club is all about celebrating nerdy passions (or making fun of them, it’s a fine line) and that pop culture enthusiasm can be expressed in all kinds of ways. Like, for instance, making a post on Quickbook Intuit’s website about the ways in which Lando Calrissian is basically a small business owner struggling to deal with the major corporation that is The Galactic Empire. 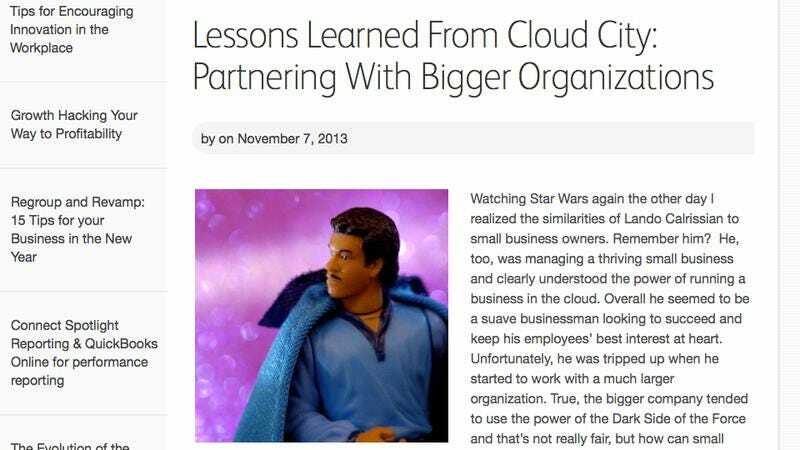 “Lessons Learned From Cloud City: Partnering With Bigger Organizations” failed to earn any buzz when it was written back in 2013, but it deserves to be celebrated now for the delightful, slightly-desperate oddity that it is. The article was recommend by A.V. Club reader and frequent business-site peruser Sam Lounsbury, who explained, “I shared it with my employees, but no one cared. I had to show it to someone else that I knew would appreciate it.” What those jaded employees failed to see is that this article not only offers practical tips for small business owners, it also provides some thoughtful analysis of Star Wars as well. For instance, it argues that Lando was just “a suave businessman looking to succeed” (no arguments here) and although he wanted to protect his employees, “He was tripped up when he started to work with a much larger organization.” Of course, he was probably also tripped up by the threat of death by Force-grip, but it’s a fair point that Lando was facing the stress of middle management even before the Empire showed up. After all, a tibanna gas mining colony doesn’t run itself (unless Cloud City is automated). The article then lists some tips to help real world small business owners avoid “pulling a Lando.” They include talking to a lawyer to make sure all contracts are equitable on both sides (again, assuming the threat of Force-grip death isn’t an issue) and making sure all technology is compatible. Or, as the article puts it, “Not everyone has a C3PO at hand to help out with the translation, so ensure you’ve got a system that integrates with the big guys.” Never has business advice been this fun and relevant. But Lounsbury may have inadvertently stumbled upon an even more intriguing behind-the-scenes detail: George Lucas claims that reading Joseph Campbell’s The Hero With A Thousand Faces helped him zero in on Luke Skywalker’s “Hero’s Journey.” It now seems clear he similarly drew inspiration from a Quickbooks website when adding all those intergalactic trade disputes to The Phantom Menace.